Nellie Bly exposed the abuses perpetrated inside mental care asylums in the late 1800s. Christina Ricci plays Nellie in the Lifetime original movie Escaping the Madhouse: The Nellie Bly Story. In this dramatization, Nellie loses her memory due to electroshock treatments and has to piece together her own story. Inside, she runs afoul of Matron Grady (Judith Light) and psychiatrist Dr. Josiah (Josh Bowman). Bowman, a fan favorite from ABC’s Revenge, spoke to Showbiz Junkies about his role in Escaping the Madhouse and working with Ricci and Light. 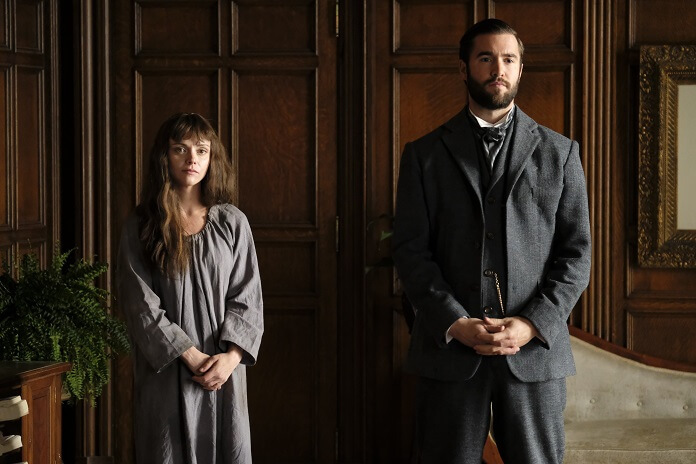 Escaping the Madhouse: The Nellie Bly Story airs Saturday, January 19, 2019 at 8pm ET/PT on Lifetime. What were the most intense or challenging scenes? Are you usually good at memorizing? You’ve made it pretty far. Did you do that a lot on Revenge? After those first three days and 23 pages did it get lighter for you? Josh Bowman: “Yes, and it was a good jumping off point, literally, because it was just all right, buddy, you’ve got three or four days. Just go, go, go. It was nice after that. I had time for everything to come through osmosis and sit into who this guy is. It was good. I didn’t get a lot of time to think. Did you get much input into your look? That’s the classic Sigmund Freud impression. What sort of relationship did you have with Christina Ricci? Was there any parallel to Revenge which took many seasons to work out all these manipulations? Were there any big Revenge twists that blindsided you? How early did you get to know that? Have the Revenge fans followed you to subsequent projects? Do you expect a little overlap between Revenge fans and Lifetime viewers? Will you watch Nellie Bly live? Did they have you live tweeting Revenge? Are you a big TV watcher? How long did it take you to watch Bandersnatch? Josh Bowman: “I still haven’t finished it because it kept repeating itself and I got fed up with it. I think it’s the worst one they’ve done. I thought the originals were just better. I love the freedom of choice, massive fan of it, but it’s not. It’s go back and re-choose what we want you to choose. Well, you’ve taken that away from me then. That’s why I enjoyed watching it.